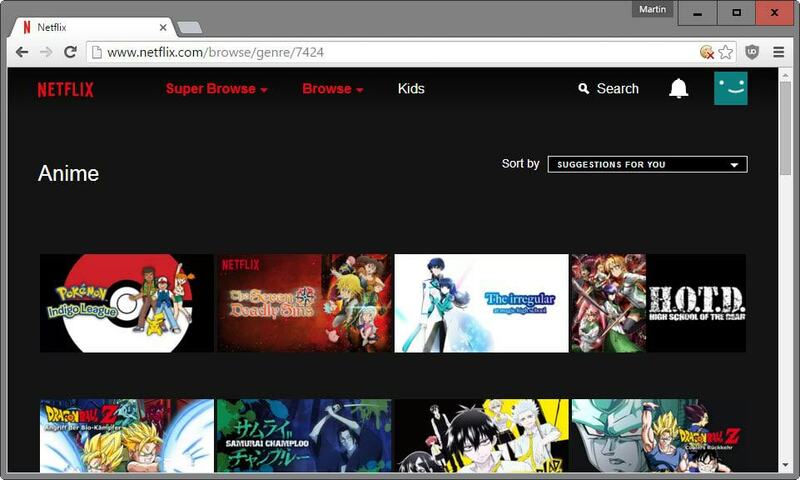 Netflix Super Browse is a browser extension for Google Chrome that adds an option to the popular streaming service to browse hidden categories. When you open the Netflix frontpage in your browser of choice, a selection of genres is displayed when you click on the browse menu. There you find a good dozen genres such as adventures, horror or children & family that you can select to browse Netflix's selection. While these genres cover a lot of ground on Netflix, you may notice rather quickly that they are far from ideal. For instance, while there is a children & family category that you can browse, there is none that displays only anime, Disney movies or movies based on children books. The same can be said for all the other categories that Netflix makes available by default. While they may display the movie or show eventually as you browse them, it is usually a lot quicker to use one of the narrow categories that are available on the site instead. Super Browse is a free extension for Google Chrome (Update: and Firefox)that adds a menu of the same name to Netflix. All it does is add all hidden categories that are available on Netflix in an alphabetically sorted list. Interested in German, Scandinavian or Japanese movies? Movies for certain age groups, e.g. kids two to four? Romantic comedies but not dramas? Super Browse has you covered. Movies and shows matching your selection are displayed once you select a category, and from there it is just a matter of browsing the selection and picking something to watch. The browser extension does not reinvent the wheel. It is a collection of links pointing to categories / genres that Netflix offers but does not advertise in its interface. You can theoretically bookmark the genres you are interested in and remove the extension afterwards. This way you could use the genres not only when using Google Chrome -- which is not the best way if you prefer 1080p playback as it does not support it currently -- but also in other browsers. The extension requires a reload sometimes as its Super Browse menu may not be displayed all the time. 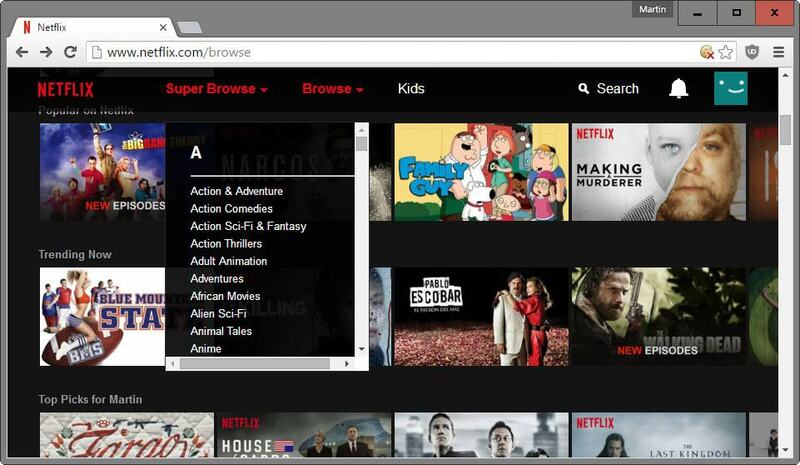 Super Browse is a handy extension if you use Netflix a lot on Chrome. The categories are no secret on the other hand which means that you can get their IDs from various Internet sites as well to access or bookmark them without installing the Chrome extension. Granted, the Chrome extension makes the process simpler which you may like. Also, if updated regularly, it will add new categories that Netflix may add automatically. I was looking at this yesterday. I downloaded it but haven’t tried it yet. I wanted to see how it worked first as I do with a lot of add-ons plus, I like to see if there’s anything in the code that I don’t like, like, unrelated and unnecessary ad/promotional links, etc. Oh cool, it is also available for Firefox. Let me update that. Or, go here and just save (right click “Save Page As”) the page and have the list for yourself. The numbers on the right are the categories. People, ya gotta learn there is no such thing as free anything. Hmmmm, “ajax” where would that data be going? You can probably do the same by downloading the extension instead of installing it, and going through the source finding the links. Thanks for the link! Thanks for sharing about the extension.